WOW ok I am slack at updating the blog!! So sorry for that!! So what have we had in the past week??? Okies!! 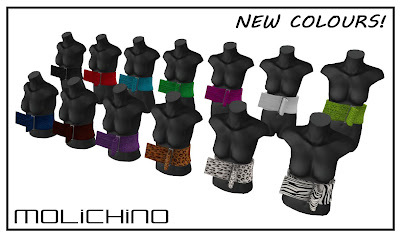 MOLiCHiNO Bindi Belts are now available in 13 colours!!! Due to popular demand I just had to create some new colours for everyone :D I hope you enjoy them!!! These EXCLUSIVE colours are only available at the TBB #1 and wont be sold in the mainstore!! So take your taxi over to the TBB Now!